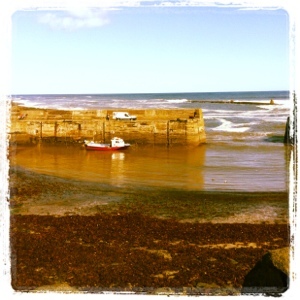 Craster is a small fishing village in Northumberland famous for it's smoked kippers! It is out mission to explore Northumberland this year and with blue skies above us, we decided to pay a visit. We arrived just after noon with 5 very hungry bellies! There were 3 main choices for lunch:- The jolly fisherman which looked like a friendly country pub with lovely fresh seafood platters and crab sandwiches on the menu, A little cafe serving homemade scones, tray bakes and cakes or the restaurant situated within the famous smokehouse. We opted to dine in the smokehouse as it's not everyday you get the opportunity and we were not disappointed. The service was friendly and we were lucky to get a window seat overlooking the bay. Steve and the kids opted for traditional fish an chips (catch of the day was haddock) while I couldn't resist the smoked salmon, apple and walnut salad (salmon was smoked in house). All of our food was delicious and plentiful. When we'd finished our meal we decided to have a look around the smokehouse shop. We were greeted by a friendly fishmonger and a large selection of lovely looking seafood. We bought some kippers (for tomorrow's breakfast) and some thickly sliced bacon that had been smoked in house. There is a 1.6 mile coastal walk to Dunstanborough castle from Craster, which unfortunately we weren't brave enough to attempt with 3 kids but we had a lovely walk about half way to the castle. We were delighted to meet some sheep and little lambs wandering freely along the route and enjoyed stopping every now and then to watch the waves and admired the views of the castle. Before heading home we stopped at an ice-cream van for some ice creams which we ate on the benches overlooking the harbour whilst watching the fishermen at work and then Harry and Steve had a quick explore of the many rocks and pools. Craster only took about 45 minutes to get to from our house and we will definitely be back in a few years when the kids are old enough to attempt the full walk to Dunstanborough if not before! Giving your first ever post some loving! Congratulations on an amazing 3 years!